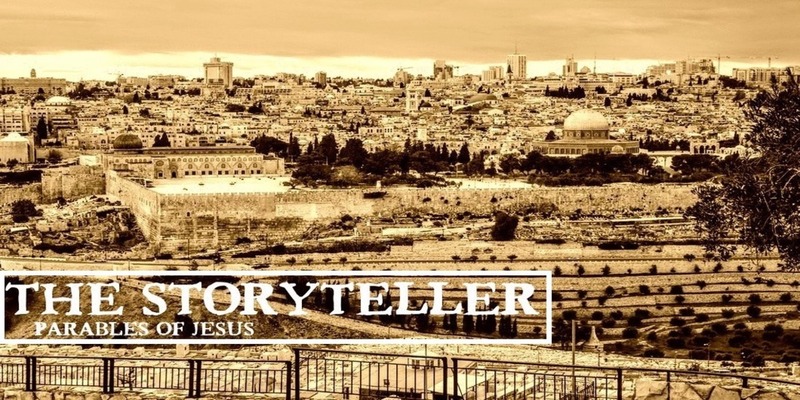 Today we are beginning a new study in morning worship, a study I’m calling, “The Storyteller.” We all love a good story. People pay money so they can watch movies, attend plays, and read books that tell great stories. Some are captivating stories of fiction and some are riveting, true-to-life stories of moments in history or the chronicles of a person’s life. Little ones love to have their mom or dad tell them a story at bedtime. Teens and adults of all ages love stories as well. People from every walk of life, in every age of history, and from every culture around the world love stories. Most of the stories today are purely for entertainment purposes, but throughout history people have told a variety of stories. Some stories, like Aesop’s fables, are told to teach morals, life lessons. Aesop, who was born into slavery and later gained his freedom, collected fables to teach people of all ages important lessons about life. Aesop used animals in his story, “The Tortoise and the Hare,” to teach the valuable lesson that slow and steady wins the race. His fable, “The Ant and the Grasshopper,” was used to teach people that one has to work for what he or she wants, you can’t be lazy and get anywhere in life. Aesop lived in the 6th century before Christ, he collected 725 fables, and many of them are still told today to teach valuable lessons about life. A more modern version of Aesop would be Dr. Seuss’ fables and the lessons he has taught us through his strange creatures. Another method of storytelling is allegory. In an allegory there is layer upon layer much more complex and larger than what you see on the surface. Allegorical stories like “The Chronicles of Narnia,” John Bunyan’s “Pilgrim’s Progress,” or “The Giving Tree” can be read and enjoyed as nothing more than great stories, but for those who are willing, there is much more there than meets the eye. Jesus taught using a variety of methods, but He didn’t use fables and He didn’t tell allegorical stories. Jesus taught in sermons, like the greatest sermon ever preached, “The Sermon on the Mount,” found in Matthew 5-7. Jesus also told many parables. It’s hard to get a grasp on the exact number of parables Jesus told. Most would agree that Jesus told somewhere between 40-60 parables. The Greek word that is translated, “parable,” is the word, “parabole” and it occurs 50 times in the New Testament. The word means, “a placing of one thing by the side of another, an example used to teach a biblical truth.” I read a definition of Jesus’ parables from Dr. Warren Wiersbe this past week that has been really helpful to me. Listen to this. A parable starts off as a picture that is familiar to listeners. But as you carefully consider the picture, it becomes a mirror in which you see yourself, and many people do not like to see themselves. This explains why some of our Lord’s listeners became angry when they heard His parables, and even tried to kill Him. But if we see ourselves as needy sinners and ask for help, then the mirror becomes a window through which we see God and His grace. To understand a parable and to benefit from it demands honesty and humility on our part, and many of our Lord’s hearers lacked both. (Wiersbe, Warren. The Bible Exposition Commentary, Vol. 1. pg. 201). A familiar picture that becomes a mirror in which we come to see ourselves. We don’t like the mirror placed in front of us because it exposes our flaws and defects. It is only when we see ourselves accurately, not who we think we are, but as we truly are before God, that the mirror can then become a window into God’s grace. Jesus then went on to use a Pharisee, the most religious person in Jerusalem, and a tax collector, the most despised in the land as His examples. You’ll have to read the parable for yourself, but I’ll serve up the spoiler: the despised tax collector left the temple justified before God and the Pharisee didn’t. And the lesson for those who consider themselves more righteous than others…they might want to rethink their definition of righteous. Jesus told parables that turned conventional thinking upside down and that is what absolutely infuriated the religious establishment of His day. You will see this so clearly, and repeated over and over again, if you continue to join us on Sundays. I want us to look at the first parable Jesus told in Matthew’s Gospel. If you will turn to Matthew 13:1-10 with me. Let’s read together. They didn’t ask one single question about the parable of the Sower. They asked, “Why parables?” Jesus didn’t invent parables. Parables were being told long, long before Jesus ever began His ministry. Parables were not invented by the Jews either, even though we find parables in the Old Testament. Parables like the story Nathan told King David after David had Uriah, Bathsheba’s husband, killed. Jesus didn’t begin His ministry by teaching parables, so why now? That’s a great question. Early in Jesus’ ministry we find Him teaching and performing miracles that captured the hearts of the people. The more Jesus taught and the more miracles He performed, the more people were drawn to Him, and the more the religious leaders fumed. The line was being drawn between those who loved Jesus and those who despised Jesus. No rejoicing with the man who had been healed. No praising God for the wonderful miracle they had witnessed. They were livid and began to come up with a plan to kill Jesus. These events are not told only by Matthew, they are told by Mark as well. In Mark, after the healing of the man with the shriveled hand, we read about more miracles that Jesus performed. And then we read about the response of Jesus’ family and the teachers of the law to the marvelous move of God. Mark says that at that point Jesus began to speak in parables. Matthew tells us about Jesus’ parable of the Sower and the disciples ask, “Why do you speak in parables?” It’s when we understand the growing opposition to Jesus and the maniacal desire of the religious leaders that we can then understand Jesus’ response to the question, “Why parables?” Turn to Matthew 13:11-17 with me and we can read Jesus’ answer. Who is the “you” and who is the “them?” That’s not a tough question to answer if you’ve been paying attention. The “you” are the disciples and those who have been listening, really paying attention, to Jesus. The “them” are the religious leaders and those who were listening, but they weren’t listening to learn, they were listening to trap Jesus, find something wrong about His teaching, and to add to their case against Him. They didn’t want to hear from God so Jesus began to hide His teaching from them in the stories He told. Isaiah said, “Here am I. Send me!” Isaiah, the man with unclean lips, living among a people of unclean lips, who had seen the Lord and had his sins cleansed, volunteered to go and do God’s work. Then God gave Isaiah his assignment. Let’s read Isaiah 6:9-10. Once again, it sounds like God was telling Isaiah to stop the people from hearing, stop them from understanding, but the truth is many had already hardened their hearts and closed their ears to the Lord. The people had hardened their hearts, closed their eyes, and stopped up their ears, but God was going to continue to send His Word among them. With God’s Word present they would only harden their hearts more. This is similar to what we read in Romans 1 where God had made Himself plain as day to those in Paul’s day, yet the people didn’t want God, they wanted to make their own decisions about their lives. And so we read three times, “And God gave them over…” He gave them over to their sinful desires, to their sinful lusts, and to their own depraved thinking. Why did Jesus speak in parables? Jesus’ parables are designed for those who have “ears to hear,” not for those who have no desire to hear from God. Right after Jesus told the parable of the Sower, He said, “He who has ears, let him hear.” (Matthew 13:9 NIVO) That’s such an important phrase for Jesus. That phrase appears seven times in the Greek New Testament. It is never spoken by anyone other than Jesus. Do you have ears to hear? I don’t know of anyone here today who doesn’t have ears and can hear the sound of my voice, but I’m certain there are people here this morning who have ears and do not hear in the way God desires for us to hear. For some of us the Word of God and God’s Will is the most precious and priceless thing in the whole world. You are like some of the people in Jesus’ parables who gave up everything for the most important thing, the Kingdom of God. For others of us who are here today, we are no more listening than a man in the moon. We may be sitting in a pew under the shadow of the stained glass, but our minds and hearts are elsewhere. Jesus spoke in parables both to conceal the truths of the Kingdom and to reveal the truths of the Kingdom. Let me explain. God revealed truth to Simon Peter and God wants to reveal His truth to you and me. The question is, “What will we do with the truth God reveals?” The truth of God is cherished and longed for by some and the very same truth is despised, dismissed, or rejected by others. It’s the same truth, so why such a wide variety of responses? Why did some say with Peter, “You are the Christ the Son of the Living God!” and others say, “Crucify Him! Crucify Him!” I’m reminded of what Paul wrote to the brothers and sisters in Corinth. Turn with me to 2 Corinthians 2:15-16 and let’s read together. Isn’t that interesting? The people of God, Paul and his companions, are the aroma of Christ, which is the fragrance of life to some and the very same people of God are the stench of death to others. How does that happen? It’s a matter of the heart isn’t it? Oh, my friend, don’t harden your heart towards the Lord. When God doesn’t behave in the way we want Him to behave or do what we want Him to do, it is so easy to harden our hearts towards Him. Sometimes we want what we want and God confronts us with our sin. Rather than repenting of our sin and turning to God we harden our heart and close up our minds to God. When Jesus spoke there were those who stiffened their necks and hardened their hearts just like king Zedekiah. Jesus’ words only caused them to stiffen their necks more, to make their hearts even harder. At the same time, there were those present when Jesus spoke, people from every walk of life, fisherman like Peter, James, and John, tax collectors like Matthew, businesswomen like Phoebe, and even Pharisees like Nicodemus who heard Jesus speak and hung on His every word. When Jesus spoke in parables that were confusing they yearned to understand and their open heart and open mind were fertile soil for the truth of God. You don’t have to wait until next week when we study the parable of the Sower. I believe the Lord is already speaking to us this very morning. Are you listening? Do you have ears to hear? Will you respond to His voice? Please, whatever you do, do not harden your heart to the Lord. Allow Him to speak to you through His Word, to reveal to you what He desires to do in your life, and trust Him that His way is far better than any other way available to you and me. If you have never received Jesus as Lord and Savior of your life, then do you recognize His voice calling you to Himself this very morning? Don’t say, “When I get my life together then I’ll turn to Jesus.” Don’t say, “When I get through having my fun and doing what I want, then I’ll come to Jesus.” Just come to Jesus.